Why would I need self storage in Dayton, OH? There are a variety of reasons why you might need self-storage in Dayton, OH. How much is a storage unit in Dayton, OH? The cheapest storage unit in Dayton, OH is $22.00 per month. What size storage units do you have available in Dayton, OH? In Dayton, OH we have sizes that range from 5'x5' to 10'x35' to suit your storage needs. How much is it for a 5'x5' storage unit in Dayton, OH? The cheapest 5'x5' storage unit in Dayton, OH is $30.00 per month. Dayton is a bustling city in western Ohio and among the largest cities in the state. It is a major hub of manufacturing and supply companies as well as a center for research and development. Dayton has long been known as a city of innovation, holding a special spot in history as the birthplace of powered flight by the aviation pioneers the Wright brothers. The area now known as Dayton spent many years as a battle site between the French and Native Americans in the latter half of the 18th century. In 1795, General Arthur St. Clair purchased the land and the town site was laid out. The first settlers were only a few families who unfortunately faced disaster between 1798 and 1799 when they found that Congress had not actually approved the sale of the land. However, with the help of local politician Daniel Cooper, they were able to purchased and settle the land properly. The first school opened in 1804, and the next year the first library opened. The town quickly started thriving, earning the nickname Little Detroit for its flourishing manufacturing industry. Dayton grew significantly between the 1940s and 1970s, welcoming many new residents and businesses. In recent years, focus has turned to revitalization projects that have helped reinvigorate the downtown. 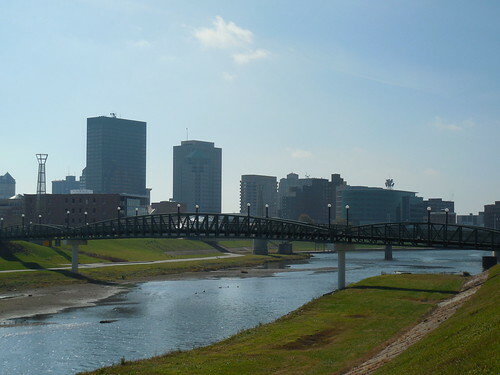 Dayton is a primarily urban area, offering a number of amenities including shopping, restaurants, several hospitals, an airport, and multiple colleges and universities. It's received recognition from several national publications for its well-rated schools, excellent health care options and thriving economy. Recently, it's been named one of the top places in the U.S. for new college grads to start a career as well as the top mid-size metropolitan area for business and economic development. Its residential neighborhoods are filled with a wide variety of affordable homes, including several historic communities that feature examples of Queen Anne, Colonial Revival, English Gothic and Tudor Revival architecture. Dayton has also been ranked among the top cities in the nation for arts and culture, beating out other large cities, including Atlanta and St. Louis. The Benjamin and Marian Schuster Performing Arts Center in downtown Dayton is a major attraction, hosting the Dayton Ballet, Dayton Opera and the Dayton Philharmonic Orchestra. You can also attend traveling Broadway shows, concerts and educational lectures at the Schuster Performing Arts Center, and it's become a popular venue for weddings and other special events. Other interesting places in Dayton include the Dayton Art Institute, the National Aviation Hall of Fame and the National Museum of the United States Air Force at Wright-Patterson Air Force Base. Throughout Dayton you'll also find more than 20 parks and recreational facilities, featuring over 70 miles of trails that connect many of the city's communities. The Dayton Public Schools manage the public schools of Dayton, including specialized schools focusing on fine arts and technology. There are close to 70 private and charter schools, providing an extensive range of options for your child's education, in Dayton. Higher education is also a major part of Dayton's identity. The city's largest campuses include the University of Dayton and Wright State University. Utilities: Dayton Power & Light and the city's water department are the primary utilities providers. If your home has natural gas, you can choose from several providers in the area. Garbage and Recycling: Trash is picked up once a week, while recyclables are collected bi-weekly. You can also request collection of bulky items, including tires and appliances. Transportation: The Dayton RTA provides a large network of public transit routes, especially through the downtown areas of Dayton. The Dayton housing market is extremely affordable, with average home prices that are well below the national average. You can find everything from very small, historic homes to large, renovated homes that are ideal for growing families. Rent is also very affordable in Dayton, with a wide selection of apartments, town houses and condos to choose from. Our lowest priced units in Dayton, OH average $33.00 per month. 227 people have reserved units in Dayton, OH in the past 30 days. There are 4 locations within Dayton, OH's city limits.